Keep your driveway from accumulating ice and snow this winter with the SaltDogg Walk Behind Salt Spreader. 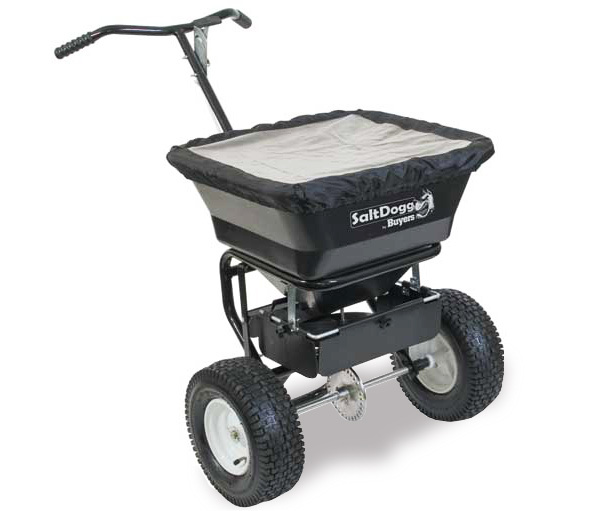 Featuring a 1.5 cubic ft. hopper with an expanded screen, this salt spreader holds up to 100 lbs. of salt. The machine's adjustable spreader lets you change the width of the spread from 3' to 30', ensuring you're not wasting salt on narrow paths. The SaltDogg is designed with as few moving parts as possible for maximum durability and reliability. The spreader's frame is made from a single-piece of welded steel and its large pneumatic tires keep their shape after heavy use. The spreader's ergonomic handles mean the SaltDogg is as comfortable as it is easy to use. Backed by a 1-Year Warranty. Does the SaltDogg Walk Behind Salt Spreader require regular maintenance? No. This spreader is made with as few moving parts as possible, making it virtually maintenance free. Even the frame is a single-piece carbon frame. The SaltDogg Walk Behind Salt Spreader features a 1-Year Warranty.